Sofi Almquist was a teacher, a textbook author, an educational reformer and a school founder. In 1892 she founded Sofi Almquist’s co-educational school in Stockholm. Sofi Almquist grew up on Ålberga estate in Kila parish with her four older siblings. She was the daughter of Lovisa Ljungberg and factory inspector Per Oliver Hultén. There is little information on Sofi Almquist’s childhood but it is known that she successfully completed her school years. In 1861 her father registered her amongst the first batch of applicants for the newly established teacher training programme for female teachers in Stockholm and she was directly accepted. She was exempted from the entrance exam, a requirement for all applicants who did not have the necessary grades in the relevant subjects. This teacher training programme for female teachers, which in 1878 changed its name to Högre lärarinneseminariet (the advanced teacher training programme), was the first further training institution for women in Sweden. It came to play an important role in Sofi Almquist’s life both formally and informally through the network she gained access to during her studies. Several of the women who later established or ran girls’ and co-educational schools in Stockholm had obtained their foundational training at the Högre lärarinneseminariet. Studies at the teacher training programme were characterized by a great freedom of choice and in-depth studies, pedagogical elements which inspired Sofi Almquist’s future work. During the autumn term of 1864 she completed her teacher training exams. Out of the 19 women who completed their studies with her Sofi Almquist was one of three who was awarded top marks in teaching competency. She spent her first three working years employed as a governess for an unknown family before she, in 1867, was invited to become part of a new school project, namely reverend Gustaf Emanuel Beskow’s school. Sofi Almquist accepted the invitation and, along with two male teachers, became the Beskow school’s first staff. A few years later the staff numbers increased to include Sofi Almquist’s future husband Sigfrid Almquist. The couple both worked as teachers at the Beskow school for some years during the 1870s. Sigfrid Almquist later became head teacher at Norra Real. When Sofi and Sigfrid got married in 1875, Sofi Almquist resigned from her position at the Beskow school. She spent the next couple of years working as a part-time teacher at state-run schools for girls while she and Sigfrid had children. The first ten years of marriage were framed by tragedies and tribulations. The couple had five children, but two of them died before they turned five; one son was still-born (1876) and one daughter died at the age of four (1881-1885). The couple’s second child, Nanna, exhibited traits of autism and suffered many periods of illness. Their two other daughters, Signe (born 1879) and Märta (born 1883) had healthy childhoods and Sofi Almquist described their development in her diaries. Both of her daughters came to play an important role when they jointly took over responsibility for Sofi Almquist’s co-educational school on their mother’s retirement in 1915. 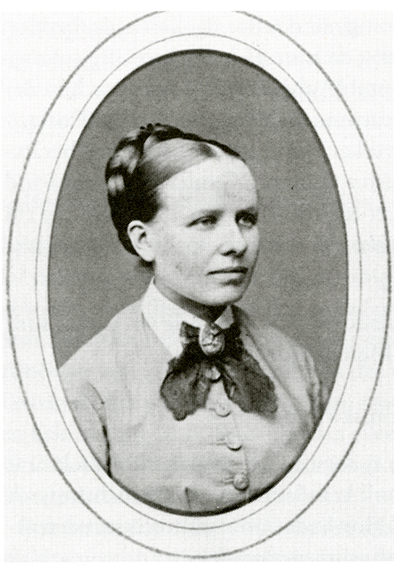 Sofi Almquist spent her child-bearing years writing two teaching textbooks: Barnens andra läsebok, published in 1877, and Barnens första läsebok, published in 1883. Both books were printed in several editions right up until the 1920s and provided a source of financial income. When her eldest daughter, Signe, was about to start school, Sofi Almquist gathered a small circle of pupils around her and set up a teaching group, which she initially taught in her home. Her teaching group grew over a five year period between 1886 and 1891. Yet another two teaching groups, each with their own teacher, were set up and premises were hired at the Eugenie Brummer’s school, who had studied together with Sofi Almquist. In 1892, after receiving an anonymous donation of 3000 Swedish kroner, Sofi Almquist decided to establish the Sofi Almquist co-educational school. The school grew quickly and, after ten years, had expanded to include a high school section and moved to larger premises on Artillerigatan. Her husband, Sigfrid Almquist, sometimes taught at the high school and was director of studies there for a few years. Their daughters also became involved in the school. Their eldest daughter, Signe Almquist, became a teacher herself and worked at the school, while their younger daughter, Märta Almquist, graduated from school as a private student, studied chemistry and started teaching chemistry at the co-educational school, despite a lack of formal teaching qualifications. In 1904 the school moved to new premises, which could accommodate around 500 pupils, revealing just how successful the project was in the beginning of the twentieth century. The school building also comprised a residential apartment for the Almquist couple. Sofi Almquist’s basic educational outlook focused on the individual’s choice, the home as an integrated aspect of school, and co-education as a vital element in normalising relations between girls and boys. Sofi Almquist’s co-educational school was not just a recognised foundational institution for children but also a seedbed for female teachers. A large number of Sofi Almquist’s teaching staff went on to become school mistresses, school founders and heads of schools. As the school grew and expanded at the beginning of the twentieth century, Sofi Almquist’s retirement age approached. When she turned 64 in 1908 she stopped teaching but stayed on as director of the school for a further ten years until her daughters took over in 1918. Sofi and Sigfrid Almquist had moved from the school to a house in Djursholm-Ösby in 1912. In 1914 Sofi Almquist was awarded the royal medal lllis quorum. She became a widow in 1922 and died in 1926 at the age of 82. Sofi Almquist’s co-educational school continued to run under her daughters’ control until the 1930s. As a consequence of new educational and political trends, Signe and Märta Almquist decided to close the school in 1935 rather than alter the basic principles that had been established by their mother. Lovisa Sofia (Sofi) Almquist, www.skbl.se/sv/artikel/SofiAlmquist, Svenskt kvinnobiografiskt lexikon (article by Emil Marklund), retrieved 2019-04-23.